This A3 color version of the companion planting chart is a useful wall chart for schools, NGOs and avid gardeners. It explain plants which are supportive or antagonistic when planted together, and includes a simple check list of insect repelant plants for various types of pests. This poster is made available by the IDEP Foundation (www.idepfoundation.org). They have some amazing media to download to inspire all. Be sure to check it out and make the most of a great resource. Grow your own organic vegetables. Learn how to choose and prepare the recycled hardwood required to build the permaculture vegetable enclosure. Designed and presented by Chris Francis. Part 1 of 9. Permaculture Practices - This video addresses harvesting rain water and using a chicken tractor (not a tractor, tiller, or plow) for GARDENING. The photos contained are experiments by a "new" permaculturist located in between DeRidder and Sugartown Louisiana. Professional Permaculturist model their gardens after nature with little if any use of the water hose or tractor, and no chemical insectisides or fertilizers; their videos can be found on Youtube by keying in: permaculture, Geoff Lawton, Bill Mollison, Fukuoka, Ruth Stout, and Sepp H. I would especially encourage your to watch Geoff's Lawton's video "Greening the Desert" if you have any doubts as to the effectiveness of this gardening method. Permacuture is good for the earth and people; and goes beyond organic. It's an entire system and lifestyle. YOU can control what you put into your and your family's body and make sure it's safe, nutritious, won't hurt the earth, and even have surplus to share with others. It also provides a peace of mind knowing that your garden is full of food regardless of what is going on in the world or your local neighborhood. One of my favorite Permaculturist, Ruth Stout, confessed to doing very little work; no weeding, fertilzing, plowing, etc. and yet was able to feed two people. Her 3 videos are filled with detailed info and a tour and demostration of her gardeing methods. This is doable. Even if you only have a balcony or small patio. You can grown something today; even if it's just planting seeds in small containers and sitting next to a sunny window in your home. A ten month permaculture experiment in Orlando, FL. Converting a bare lawn into an edible food forest. Some fantastic inspiration too. Cath Colon is a Houston based environmentalist and has been involved in building environmentally friendly homes and businesses for 20 years. Conlon established Blackwood Educational Land Institute, which has been an important teaching tool for many schools, teachers and professionals. She is a certified permaculture designer and master gardener. On Living Smart, Cath Conlon will discuss why by protecting the environment, we save ourselves. On Friday 9th July over 100 volunteers from companies across Nottingham gave their time to help Ecoworks begin its permaculture revolution. The results were staggering. This really is an inspiring piece of video showing that a community can come together and put something in place that will benefit people for a long time - not just one season. The event was organised by John Macdonald and Antony Dumskyj of Ecoworks (Nottingham, UK). Food forests are at the heart of Permaculture and fast becoming a hot topic in many areas of debate as people realise the their full potential. Let's face it, with our all consuming global problems, there aren't many natural solutions out there that can halt & reverse deforestation, stabilise the climate by returning carbon to the soil where it belongs, solve poverty & extreme hunger all in one hit are there? Yet this is exactly what the food forest is capable of, and provided people understand it and are at the centre of the system, they can go on living off that land forever. Here is a video of Geoff Lawton showing a series of food forests that have been planted at Zaytuna farm over successive years. For more information about food forests and all things permaculture see http://www.permaculture.org.au. The Permaculture Research Institute of Australia also sells a full 90 minute DVD featuring Geoff Lawton as he demonstrates how to grow a food forest from start to finish. Our permaculture teacher brought his advanced class to our house to transform our front lawn (lawns are apparently NOT sustainable living-ish) into a garden and food forest. This is what went on the first weekend. We dont have a lawn per se but open space that is shady and is an extremely prolific grower of plantain plants. I dont like them to grow too large because snakes hide in them and this is where my kids run and play. Its my hope use the chickens in a controlled manner to begin to outcompete the plantains by over grazing and replanting with something less snake-harboring. The snakes have plenty of other habitats around here! I will have to take a hoe to the remaining roots of the plantains once the chickens have eaten them. Created on June 24, 2010 using FlipShare. Let's start growing our own food!! This is a gorgeous little permaculture garden I discovered down the road from my home while running in the morning. It's beautiful, I love it. I love it so much that I want to spend lots of time sitting around it soaking in the energy from the beautiful plants. And today a dog came out of nowhere and said hello! Random. A clip from Growing Edges, a film by Starhawk, about permaculture & regenerative design featuring Tim & Maddy Harland, Permanent Publications & The Sustainability Centre. Put your feet up and watch a lovely little film from Undercurrents about natural building. Introducing the concept of low impact autonomous buildings made from recycled and natural materials with renewable energy system, even biological water cleansing systems! A little bushcraft knowledge never goes astray! This is a clip from the DVD The A-Z of Bushcraft avilable from www.green-shopping.co.uk, Permaculture Magazine's online store. A short "How To" build a no dig elevated potato tower using bamboo, recorded from an Australian TV channel. More and more I'm starting to think that the word 'survival' is a Western concept. All cultures the West refers to as indigenous don't see their existence as survival, it's living, and enjoying their habitat. I think we should consider this and understand that we are all of the Earth. We should remember that. Survival is something that happens when an animal lives despite having no idea how to prevail. If the time is put into understanding the natural environment around us, we can enjoy a natural existence and call it life.Here's a video from an inspiring chap known simply as Koa. He says: Thrive and survive in the Australian bush. For Koa his lifestyle is a quest for the kind of freedom a wallaby has, knowledge to provide for yourself in the Australian bush drawing on a lifetime of living close to nature. Koa thakes the viewer on a journey of self empowerement, 60 minutes of valuable information on how to thrive and survive in the Australian Bush, Koa runs Bush tucker and natural living skills workshops and markets his handmade musical instruments and baskets all over Australia. Barb Ford explains how to make and use a Solar Cooker. If you thought cooking with Solar was a slow process then watch this short demonstration. While we were shooting the Permaculture Soils video with Geoff Lawton, we noticed an array of shiny solar cookers being assembled on the jetty at Zaytuna Farm. Barb Ford from Brisbane was cooking the afternoon lunch for the woofers and students on the farm. Taking a break from our filming, we asked Barb to give us a run down on the various cookers she had on display and explain their uses. Not all Solar Cookers are the same. Some act as ovens whilst others act as direct burners. I always had the idea that it took forever to cook a meal under solar but as I discovered, this is not the case. Barb soon whipped up some Australian Damper, a boiling pot of coffee, scrambled eggs and a delicious stew that we ate for lunch. The amazing part is that you can make a solar oven from just about anything. As Barb explains in the video, old pizza boxes make great solar cookers, but its probably best to use the big pizza boxes to be more effective. In fact she says election posters can be re purposed to make great solar heaters and actually prove to be more useful than the candidate they depict! Geoff Lawton later explained to us that Barb is in fact a medical doctor – studying to become a woofer on the farm! What a remarkable woman and career combination! A Fun Composting Guide For ALL Ages! Composting is a real science, and not only is it interesting, but a real eye opener about how soil really is alive, teeming with millions, billions!, of microbes. One handful of dirt has more to it than we will ever understand, but as long as we feed the soil, plants will be able to feed themselves, and thus, so will we! This is a great poster - easy to understand and fun for all ages. Get composting! Masanobu Fukuoka, author of The One-Straw Revolution, practiced a system of farming he refered to as "natural farming." Fukuoka was one of the pioneers of no-till grain cultivation. His system is referred to as "natural farming", Fukuoka Farming, or the Fukuoka Method, and was a source of inspiration to Bill Mollison. He famously said “Observe Nature thoughtfully rather than labour thoughtlessly”, the essence of the permaculture approach. "Permaculture Magazine helps you live a more natural, healthy and environmentally friendly life. Permaculture Magazine offers tried and tested ways of creating flexible, low cost approaches to sustainable living. Permaculture Magazine is published quarterly for enquiring minds and original thinkers everywhere. Each issue gives you practical, thought provoking articles written by leading experts as well as fantastic eco-friendly tips from readers!" One of the extra scenes not featured on the "Establishing a Food Forest" DVD because of space limitations, but still interesting enough for anyone considering using bamboo in Permaculture design. 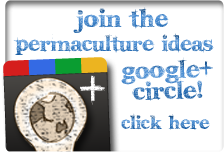 Permaculture Ideas is a place to find a range of articles, videos and latest news related to Permaculture. A vast resource for those looking for an introduction, inspiration or to further their understanding on the matter. Whether you skim the top or dig deep into the archives you'll no doubt be inspired by the wonderful ideas Permaculture brings! Subscribe below and any new posts go straight to you, making it even easier to get your Permaculture Ideas! Donate to the Blogger. Keep this blog moving and shaking. Brassica oleracea - Labourless Food!